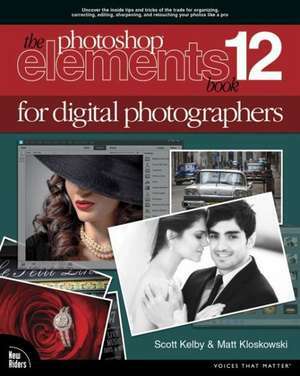 Adobe's Photoshop Elements is America's #1 selling consumer photo editing software, and this updated book-covering both Windows and Mac-breaks new ground by doing something for digital photographers that's never been done before: It cuts through the bull and shows exactly "how to do it." It's not a bunch of theory; it doesn't challenge readers to come up with their own settings or figure things out on your own. Instead, it tells readers flat-out which settings to use, when to use them, and why. This book gives the inside tips and tricks of the trade for organizing, correcting, editing, sharpening, retouching, and presenting photos like a pro. Scott Kelby is Editor, Publisher, and co-founder of Photoshop User magazine, Executive Editor and Publisher of Lightroom magazine, and host of The Grid, the weekly, live, webcast talk show for photographers, as well as the top-rated weekly video webcast, Photoshop User TV. He is also President of the online training, education, and publishing firm, KelbyOne. Scott is a photographer, designer, and award-winning author of more than 50 books, including The Adobe Photoshop Book for Digital Photographers, The Adobe Photoshop Lightroom Book for Digital Photographers, Professional Portrait Retouching Techniques for Photographers Using Photoshop, Light It, Shoot It, Retouch It: Learn Step by Step How to Go from Empty Studio to Finished Image, The Photoshop Elements Book for Digital Photographers, and The Digital Photography Book, parts 1, 2, 3 & 4. Matt Kloskowski is the Education and Curriculum Developer for the National Association of Photoshop Professionals, and co-host of The Grid, the popular weekly online show about all things photography. Both Scott and Matt live in the Tampa Bay area.